This is the seventh part of my previous post on a quest of a suitable figure for Iligan City’s Relative Hardship for 2005. This installment considers education conditions. Previous posts discussed a comparison of economic, political, public service, climatic, religious, safety and health conditions in India and the Philippines. Education conditions include state education standards, expenses, mother-tongue teaching, and school proximity to home. One of the world-acknowledged education standard is the measure of Human Development Index [HDI], which was introduced in a previous post. Using 2005 data, the Education Index [EI] for India is 0.620 and the Philippines is 0.888. The Education Index, see Fig. 1, is calculated from (2/3) of the country’s relative achievement in both adult literary and (1/3) combined primary, secondary and tertiary gross enrollment. World Bank (2005) reports that Adult literary rate for 15 years and older for 1998-2004, India at 61%; Philippines at 93%. Similarly, World Resources Institute (2005) estimates in 2004, India’s literacy rate for adults over age 15 is 61%; the Philippines at 95%. Education for All Monitoring Team (2007) for the E9 group (Bangladesh, Brazil, China, Egypt, India, Indonesia, Mexico, Nigeria and Pakistan), focusing respectively on education quality and literacy, predicts that the goal of 97% adult literacy rate is at serious risk of not achieving the goal by 2015 in India and Pakistan. The CIA World Factbook (2008) reports that in 2005, India’s education expenditures amounted to 3.2 per cent of GDP; while the Philippines was 2.5%. UNESCO’s World Education Indicators [WEI] (2007) places great importance on the cross-national comparability of indicators. 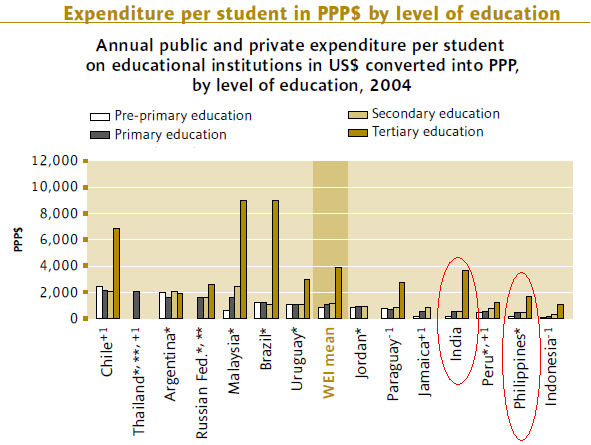 In terms of 2004’s annual expenditure on educational institutions per student in PPP$, see Fig. 2; for India: pre-primary 104, primary 484, secondary 524 and tertiary 3668; while for the Philippines: pre-primary 99, primary 458, secondary 461 and tertiary 1661. World Resources Report (2005) explains: An international dollar based on Purchasing Power Parity [PPP] rates, although not adjusted for inflation, buys roughly the same amount of goods and services in each country. PPP rates are estimated through extrapolation and regression analysis using data from the International Comparison Programme [ICP]. The WEI (2005) Annex A5b illustrates the National Education Programmes based on International Standard Classification of Education [ISCED97] setting the same criteria for various educational levels. Comparison of theoretical starting ages of schooling in India and in the Philippines in shown in Fig. 3. Only Type A programmeslargely theoretically-based and designed to lead to advanced research programmes or highly skilled professions (i.e., engineering)were considered here for tertiary education. Although obvious differences exist, typical schooling in both countries span between the ages of three and 26, or an approximate total of 23 schooling years! Thus, considering both annual expenditures and schooling years, it is rather conspicuous that it is much cheaper to get education in the Philippines, compared to India. Wikipedia describes that in India, the media of instruction switches among English, Hindi, and the respective states official languages. Private schools usually prefer one of the first two choices, while public schools tend to go with one of the last two. In the state of Maharashtra, where Mumbai and Nagpur are situated, English or Marathi is used. Hohenthal (2003) finds: In education, government and employment, [English] is the most preferred medium. . . The usefulness of Hindi as a lingua franca [is] regionally limited . . . [majority] opined that all children should learn English at school. There are, however, no detailed web-available information on the percentage of time per subject where English is used as medium of instruction. In the Philippines, Dean Jorge Bacobo in his Philippine Commentary blogs: There are five official Subjects in the Basic Education Curriculum (first adopted 2002)English, Filipino, Mathematics, Science and Makabayan (includes: Social Studies, Music and Arts, Technology and Livelihood, and Values Education). In elementary and secondary levels, only English, Mathematics and Science subjects use English as mode of instructions. Refer to Fig. 4 below. Using Bacobo’s data, English is preferred 1225% more than Filipino in elementary; while Filipino is preferred almost 410% more than English in secondary. Is this one of the root causes why Filipino students, being taught in Filipino most of the time the previous four years, are having difficulty comprehending most college subjects where English is the media of instruction? Kim (2004) states that the use of lingua franca (Tagalog, Cebuano and Ilokano) for instruction was implemented on several schools beginning 1999. One study by Yanagihara (2007) finds that scholastic achievement rates for mathematics, science and English taught in English are low indicating a problem with the media of instruction, particularly in Cebu. Fortunately, some universities hosting international students use English for majority of its subjects. Schools are located in urban centers, and most universities are situated in the capital cities. Private school systems comprise 76% of the higher education institutions in 2005. (CHED, 2005). Thus, English is also dominant as a medium of instruction on various education levels in the Philippines. UNESCO WEI (2007). World Education Indicators – 2007, Education Counts; Benchmarking Progress in 19 WEI Countries Montreal: United Nations Educational, Scientific, and Cultural Organization (UNESCO), 2007. pp. 70, 88-9. back to text: note 1. note 2. Disclaimer : The posts on this site does not necessarily represent any organization’s positions, strategies or opinions; and unless otherwise expressly stated, are licensed under a Creative Commons Attribution-Noncommercial-No Derivative Works 3.0 Philippines License.